Above everything else, Lara loves the dogs. 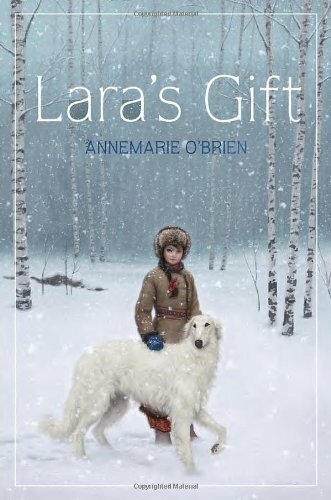 Lara works with her father, a kennel steward raising borzoi — a special kind of wolf-hunting dog. In imperial Russia, where the Tsar still rules, the winters are endless and the wolves must be kept at bay, therfore the dogs are highly valued. Lara knows how the kennel works, but she also dreams of what will happen to the dogs she loves. These dreams let her get to the births faster, and ease their pain earlier. Lara’s mother says the visions are a blessing; her father says they are a curse. Lara herself must come to terms with the visions before she can go to battle for her own destiny. How can she convince her father and herself that despite her gender and her visions, she should continue to work with the dogs? Lara’s challenging coming-of-age story is also a study of contrasts. The coziness of the kennels contrasts with the vast Russian wilderness. The sweetness of the dogs she works with contrasts with their fierceness when dealing with wolves. And her own image of her work stands starkly against what the norms for a Russian girl at that time. This will make an exciting read aloud for third grade and up, though fifth grade and sixth grade readers may want to zoom ahead on their own too. We move back into time and across the continents, not only with the story, but with the words O’Brien uses. Her characters use Russian slang, which is explained in the glossary. Their tone feels slightly formal, which also befits the estate they are living in. And in O’Brien’s extensive author’s note, she offers a short history of the area, a history of the dog breed, and a note cautioning readers not to run out and get one of these giant dogs.